It’s nearly Halloween and that means it’s time to dig out your sand worm costume and convince your buddy to take on the tail. Also, a lot of people seem to be really into watching things that are scary. But here at Cinema Blend we’re not easily frightened. We laugh in the face of terror, and the harder we laugh the better. This Halloween we’ll be gathered around our TVs giggling, because there’s nothing we love better than the blending of comedy and horror. To figure out the best way to get our horror-comedy jollies, I gathered together the Cinema Blend team in my secret laboratory and attached electrodes to their heads. After a passing thunderstorm charged the batteries powering my brain-o-matic, I threw the switch, overloading their tiny little writer heads with massive doses of electricity. The results were nearly as dramatic as the drool dripping from their lips. Beneath their babbling I detected a pattern. They'd come up with a brand new CB Top 5! It's alive!! JARAD WILK: Mel Brooks' Young Frankenstein tells the story of a Dr. Victor Frankestein (Gene Wilder), a young neurosurgeon who inherits a castle from his legendary grandfather, Dr. Victor von Frankenstein. The young doctor believes his grandfather's re-animation projects were junk. That is, of course, until he discovers the mad doctor's books and laboratory, and tries everything for himself. Brooks parodies a classic character, earlier portrayed by Boris Karloff, to perfection in a campy, not-so-horrific way. The jokes and dialogue are smart, and the cast is top-notch, led by Wilder. Terri Garr as Inga will making you want to "roll, roll, roll in ze hay" with her, while Marty Feldman's Igor will make you want to have your very own witty hunchback, whose hump seems to move in every which way. The movie will also have you wanting your own 7-foot tap dancing monster, played by the late, great Peter Boyle. It is a campy masterpiece that will have you screaming Frau Blucher to see if a creepy Cloris Leachman will walk through your door and ask you if you need anything before bed, or just to see if the horses will scream. Mel Brooks proves, once again, why he is the king of parodies and one of the all-time great comedic minds in Hollywood. JOSH TYLER: Young Frankenstein has been a staple in my life for as long as I can remember. Jarad’s right, Mel Brooks is indeed the king of parodies and one of the all-time great comedic minds in history, but so is Gene Wilder and putting those two together resulted in one of the all-time, great comedies. Somehow, it’s even funnier because it’s in black and white. The really great thing about it is that even though Brooks is indeed a parody king, Young Frankenstein is so much more than a parody. It’s a fully developed, gut-busting, sometimes edgy comedy all its own, a wicked spin on the Frankenstein legend carried by brilliant performances from the greatest comic actors of its time. 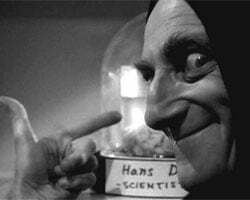 It’s impossible not to like something about Young Frankenstein and even if Wilder or Brooks don’t do it for you, I defy anyone to watch and not be blown away by Peter Boyle delivering the kind of monstrous comedic performance which can only be described as legendary. TIM KENNARD: Army of Darkness is a wild ride that mixes a great, albeit ridiculous story, with outstanding characters and laugh out loud one liners. A direct sequel to Sam Raimi's Evil Dead, Army of Darkness continues the adventures of Ash once he is sucked into another dimension where sword fights, monsters, and magic make up the landscape. One of the great things about this film is first and foremost Bruce Campbell. In my eyes the man can do no wrong and his portrayal of Ash is his most memorable. Campbell brings small injections of the 20th century into the medieval backdrop of the film. Plus, where else are you gonna see a sword fight where one of the opponents has a chainsaw for an arm? Before he gave all of us geeks Spider-man , Raimi bombarded us with the Evil dead trilogy. Magic, wenches, Bruce, and the Necronomicon are all I need for a satisfying Halloween. 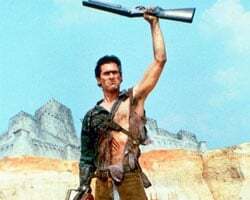 RAFE TELSCH: Despite being rather cheesy in effects, story, and acting, I’d still lay a bet that Army of Darkness is the single best cult movie of all time. You know exactly how dedicated the movie fanatics around you are if you call out a quote from Army’s protagonist Ash and receive a cacophony of “This is my boomstick,” or, “Shop smart. Shop S-Mart.” And why shouldn’t people recite the lines like Shakespearan literature? After all, in Bruce Campbell’s capable hands the film’s dialogue is just as poetic. How Army isn’t at the top of this list is beyond me. Gather together Legion of Deadites – we have other movies to conquer! STUART WOOD: The original Gremlins managed that rare thing of being scary and ridiculously funny at the same time. Made back in 1984 by black comedy horror genius Joe Dante under the guidance of the mighty Steven Spielberg, Gremlins took what seems to be just another cozy family Christmas movie and turned it on its head with a sly grin. The Gremlins themselves are both hilariously mischievous one minute and frighteningly vicious the next. The balance between the two is perfectly achieved so that neither element overshadows the other, resulting in a classic film. It was also the movie that made me fall in love with Phoebe Cates, long before her other more eye opening roles. FRANCK TABOURING: They're not just clever and mischievous, but they're also hilarious. 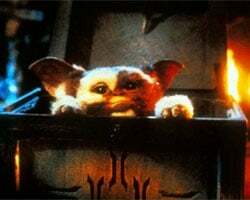 I can't remember how young I was when I saw Gremlins for the first time, but the movie scared me. Today, it just makes me laugh, and counts as one of those classics that you occasionally throw into your DVD player when there's nothing else to watch. The idea alone of an exotic pet that unleashes a horde of evil creatures whenever it gets wet is timeless, but the thing that fascinates me most about Gremlins is the film's irresistible humor, and how it eagerly engages in satirical comments about Christmas and monster movies, among many other themes. Now let’s go get them wet! STUART WOOD: Who ya gonna call? Ghostbusters is one movie brimming with more pop-culture reference material than any movie today can hope to have in 20 years. Capturing comedy director Ivan Reitman and all the main cast on their career highs, Ghostbusters is what happens when the stars align over Hollywood. What other movie could possibly pull off the trick of having the destroyer of the world be a 50ft man made out of marshmallow and make it work? And of course, who doesn’t know (even if they don’t admit it) most of the words to Ray Parker Jr’s anthemic theme song. 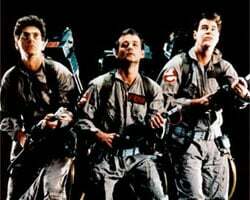 KELLY WEST: Who would have guessed that a film about a bunch of geeky scientists de-ghostifiying New York City, destroying Gozer (the De-Struc-Tor) and melting a giant marshmallow man would be a hit? Ghostbusters may have a strong focus on the paranormal but at heart, it's a comedy that showcases a brotherhood of nerds who love New York and are willing to go out of their way to keep the city safe and ghost-free. Those of us who grew up in the 80's probably cant count the number of times we saw this movie. We quoted it verbatim, played "Ghostbusters" with our friends and begged Santa for a proton pack. Like any film made decades ago, it's a bit dated now but the humor is still fully intact. It was a great in 1984 and it's still one of the best horror-comedy films ever made. BRIAN HOLCOMB: The brilliance of Edgar Wright’s “rom-zom-com” is that it’s not a parody of the zombie genre so much as it’s a romantic comedy amid the backdrop of a zombie outbreak. It’s best and biggest joke is that in our jaded and self absorbed modern world, a zombie epidemic could almost slip by unnoticed. 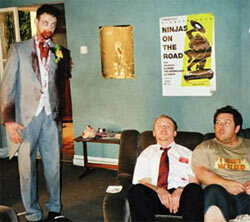 Surely Shaun (Simon Pegg) and his best mate Ed (Nick Frost) have all kinds of daily distractions to keep them busy. From their nightly bar haunts to rounds of video games and channel surfing, there’s too much(or too little) going on to really notice that some folks are stumbling around London in various stages of decay. Wright effectively borrows from Phillip Kaufman’s 1978 version of Invasion of the Body Snatchers to create a slowly building sense of urban paranoia out of overheard conversations and barely glimpsed chaos. Along with co-writer Pegg, he succeeds where many others have failed by enforcing a very tight three act structure to a concept that could’ve ended up as a series of random sketches. The movie simply tells the story of how boy wins girl by fighting off hordes of the undead. Smart and sophisticated, Shaun knows its genre well, from Romero’s canonical trilogy to the far crazier variations by Italian “Godfather of Gore”, Lucio Fulci. The knowing wit can be heard in the music score by Pete Woodhead and Daniel Mudford as well. It’s a hilarious pastiche of classic Italian horror film tunes by Goblin and Fabio Frizzi that stabs the whole Four Weddings and a Funeral rom-com genre in its sickly sweet, sentimental heart. ALEXANDRA CALAMARI: Have you ever tuned into a zombie movie and thought, "man if a slow-moving, groaning undead person ever tried to eat my brain, I'd just hit him in the face with a shovel!" Well in Simon Pegg's hysterical horror spoof Shaun of the Dead he does just that and more to escape local suburbanites turned zombies. What makes this film so incredibly classic is how nothing at all changes for the heroes despite the fact that they are fighting off the undead – they still have time for fart jokes, relationship issues, pints at the Winchester pub, not to mention an incredible dance sequence to Queen's "Don't stop me now." The best part is you don't have to be familiar with any of the horror films that inspired the movie to appreciate Pegg's deadpan humor (no pun intended). MACK RAWDEN: Regardless of what my esteemed and occasionally wrong editor Josh Tyler tells you, Shaun Of The Dead is flat out brilliant. Unlike most conventional zombie attack movies, Edgar Wright’s film simply uses the undead uprising as a side-plot, irritating the protagonists in the same way as a traffic jam, lost piece of luggage, or other petty inconvenience. Wright and Pegg work brilliantly together as two slacker roommates and their sometimes subtle and sometimes over-the-top interactions provide almost constant laughs. A lot of spoof films lampoon or openly insult the genre they are poking fun at, but Shaun of the Dead laughs with its predecessors, allowing true horror fanatics to smile with them. And if all that isn’t enough, Shaun provides one of the funniest lines in comedy history: “Did you know on several occasions....he touched me?” (Long pause) “That wasn’t true. Made it up. Shouldn’t have done that.” You just can’t go wrong with a good molestation lie. Right, Mike Nifong? Which horror comedy is your favorite?